The stigma of mental illness still exists today. Most people suffer in silence because of it and this stigma needs to be fought. Here in Canada, the company Bell hosts a day they call, Let’s Talk. This year it is held on Tuesday, January 28. On this day, they donate money mental health research and organizations that work to help those with mental illnesses. This day is meant to raise awareness of mental health issues. They want to end the stigma of mental illness that is still rampant today. I have experience with mental illness. I have family members who suffer from depression and schizophrenia. I have an anxiety disorder as well as have suffered with depression. I know the stigma attached to these illnesses and it took me a long time to get past my fear of the stigma to sharing my issues with people. Below are some facts from the Bell Let’s Talk website. I would be included in this stat. I used to suffer in silence because I feared judgment and rejection. I started struggling with depression when I was ten years old and feared how people would judge me if they found out all the thoughts that ran through my head and that I was depressed. It took me until the age of nineteen before I started telling people about my depression. I find this fact ridiculous. No wonder people suffer in silence and fear judgment and rejection. If you heard friends saying that they wouldn’t socialize with people because they were depressed or had some other form of mental illness, would you want to tell people you had this illness. No. Why is having a severe mental illness seen differently than having a severe physical illness? It helped me tremendously when I finally reached out for help with my depression. I saw a mental health worker and just talking with her about my struggles helped. She also helped me realize that I had an anxiety disorder which played a huge part in my depression. Getting help and just talking about issues such as depression helps. I could have been one of these statistics. I guess I still could but it’s not as likely as it was a few years ago. When I was depressed, I was suicidal. I hoped and prayed that I would die. I would think of ways I could end my life. At the worst of my depression. I would imagine myself taking a knife and piercing my heart with it. I would imagine suffocating myself. I would think how many pills I would have to take to end my life. I even considered driving off a bridge and even researched suicide methods. You may never know if someone is considering suicide. Most people don’t realize how much mental illness controls your life. My anxiety disorder has controlled my life and in the last while I’ve tried to take it back. People with mental illness want to be seen as normal even when they don’t feel normal. Help end the stigma on mental illness so more people feel free to talk about it and seek help. Below is a video of a young woman sharing her story with mental illness. If you want to watch more, there are more videos on the Bell Let’s Talk website. Recently, I was contacted by a man named Cameron Von St. James. He shared with me the story of his wife’s cancer and how they created a day to celebrate it. Eight years ago, his wife was diagnosed with mesothelioma, which is a rare cancer caused only by asbestos exposure. She had a surgery to remove her left lung, which was a risky procedure but it saved her life. My wife’s chronic illness taught us the importance of acknowledging and overcoming our fears, something that prevent us all from living life to the fullest. 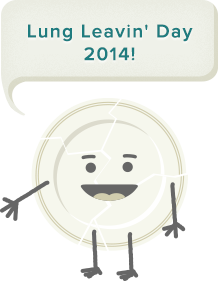 The purpose of LungLeavin’ Day is to encourage and empower others battling their own illnesses and daily challenges to face their fears! On this day we celebrate for those who are no longer with us, for those who continue to fight, for those who are currently going through a tough time in their life, and most importantly, we celebrate life! Each year, friends and family gather at our house around a bonfire where we write our fears on a plate and smash them into the fire to represent conquering our fears. This year, they have created an interactive page which tell the story of the day and people can do their own smashing of their fears. You can visit the site at www.mesothelioma.com/heather/lungleavinday. I think this is a wonderful idea and I plan to take part in it. Sure, writing our fears on plates and smashing them in a fire will not remove all of our fears but it is symbolic and sometimes doing something like this reminds us to not let our fears control us. Our fears try to prevent us from living life to the fullest and we need to acknowledge our fears but not let them control us. I know I have many fears and I think this would be a good exercise for me but also for others. I’ll be participating. Who will join me in smashing our fears?